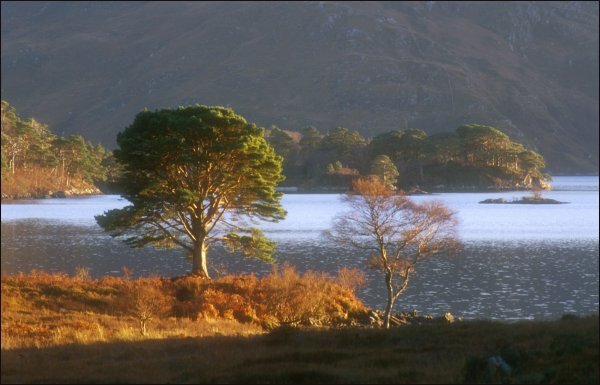 A Scots pine tree (Pinus sylvestris) on the shore of Loch Morar in late afternoon. The Scot's pine is the native coniferous tree in Scotland and with the siver birch (Betula pendula) once covered most of the Highlands before the forests were cleared. In many areas today, overgrazing by sheep and deer prevent the natural re-generation of these forests, but a few native forests have survived, like this one around Loch Morar, and others in Rannoch, Rothiemurchus, and Glen Affric. Loch Morar is the deepest loch in Scotland (more than 300 metres), and like Loch Ness is also said to be inhabited by a mysterious monster. Copyright © Transcotland Ltd. 1998.